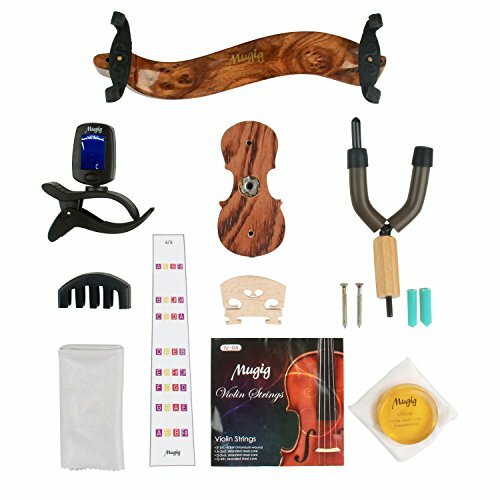 Total 10 items are included in one package: violin strings, tuner, hanger, violin shoulder rest, guiding stickers, rosin, mute, bridge, cleaning cloth. Beginners friendly, brings you an extraordinary experience of playing violin. Wood shoulder rest designed following the rules of human engineering, helps you hold your violin easily and reduce the aches. Electronic tuner helps you adjust your tunes which are greatly helpful for beginners. Rosin for all instrument with bow ,such as Violin, Viola and Cello, enhances friction for bows.